In my last post, I talked about how I set up my writing journal. In this post I will explain how I set my visionary goals. When designing goals, there are three things we are advised that make a good goal. The first is it should be specific with a clear definition and a recorded start and end time. Second, the goal should be measurable so you know if you achieved it. Third, the goal needs to be achievable i.e. it is something you have the skills or can get the skills to accomplish. A visionary goal is different. It encompasses something we feel deeply about- something that may not be measurable. As an educator, I have written and been guided by thousands of measurable goals and objectives. 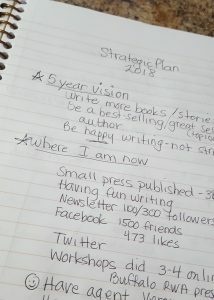 So why do I start off my writing journal with my rather nebulous five-year visionary goals? I do so because while being practical is a sure way to get work done, they do not inspire. And if there is something a writer needs to have tucked into their psyche, it is inspiration. So this year, I have set myself the following five-year goals. As you can see these are definitely not measurable objectives nor well-defined. I don’t specify a set number of books and stories. I don’t name the genre or the topics, and five years is pretty broad range in terms of a time-frame. These are goals that come from my hopes and dreams. I talk about love, heart, and happiness– very general words that we can all argue about. What does it mean for a reader to love a book? What does happiness feel like to a writer? What is a story from the heart? Despite their nebulousness, these are definitely goals I want to attain. What writer doesn’t want to keep writing more and more wonderful books and stories? What writer doesn’t want their stories read by appreciative readers? Why write at all if it makes you feel stressed and unhappy? However, just because these are visionary, doesn’t mean that we can’t use them to delineate our writing career path. So the next step is to take each visionary goal and place it in this sentence, and voila, you will have a nicely packaged measurable goal to guide you – but one that has heart at its core. In order to _________________ (visionary goal), I will ______________ (your activity) for ____________ (time-frame). In order to write more heartfelt books, I will write at least 2 hours a day, 7 days a week. Now that is definitely something that will keep me on track, but also incorporates my dream of writing more stories from my heart. I also use my visionary goals to come up with a slogan to hang over my computer. Here is this year’s. Work hard. Work happy. Work inspired. Setting goals is key to feeling successful. When you can track your progress, when you can count the number of words or pages written, and the number of stories sent out into the world, you know you have accomplished something. But if that leaves you stressed or you do not love what you have written, then it is all for nothing. That is why for me starting with visionary goals is more fulfilling and, in the long run, leaves me happier as a writer. Do you set visionary or practical goals for yourself?